This first blog entry on Piracy-studies.org summarizes the state of affairs in the international community’s effort to fight piracy off the coast of Somalia. It describes some recent dynamics and tendencies, and portrays some possible future scenarios of the evolution of the piracy challenge and the international engagement in the Gulf of Aden and beyond. The entry is based on articles, reports and comments provided by international as well as Somali news agencies, media pools and institutions. In 2008, Piracy in the Gulf of Aden became rampant and subsequently gained increasing attention of the media and policy makers around the world. In 2008, the International Maritime Bureau (IMB) recorded 111 incidents related to Somali pirates, a trend that continued in 2009. Before the monsoon lead to a temporary halt of piracy activities in summer, they had already attacked more ships than in the year before. At the end of 2009, the IMB had recorded 217 attacks on vessels with 47 successfully seized. At the beginning of January 2010, 12 of those ships and 263 crew members were still held captive for ransom. 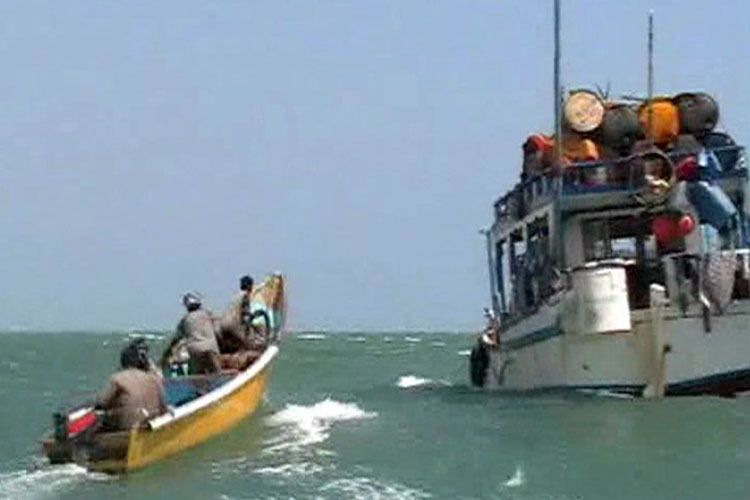 As piracy become more and more recognized as a “security problem” by policy makers and in response to the high media attention, the international community started to legitimize counter piracy measures off the coast of Somalia in order to safeguard the vital shipping line through the Gulf of Aden. Acting under chapter VII of the Charter of the United Nations, the UN Security Council Resolutions 1814, 1816, 1838, 1846, 1851 (all 2008) and 1897 (2009) allow and actively encourage international naval forces to “enter the territorial waters of Somalia” (1816) and to operate on shore “in Somalia for the purpose of suppressing acts of piracy and armed robbery at sea” (1851). These resolutions thus indicate the increased securitisation and a significant step towards militarization of the international engagement in the Gulf of Aden. Various states and international organizations are actively engaged in the crisis region. There are currently three navy missions in the greater Gulf of Aden region: the Combined Task Force 151 (CFT – 151) led by the USA, “Operation Atalanta” under the European Union Naval Force (EU NAVFOR) and NATO’s “Operation Ocean Shield”. Moreover, at different times several countries additionally deployed warships in support of the ongoing missions, among them China, Japan, Iran, India and Russia. Altogether, around 40 naval vessels are engaged in the combat against piracy. Commercial ships can register at The Maritime Security Centre – Horn of Africa (MSCHOA) and use the Internationally Recommended Transit Corridor (IRTC), where EU NAVFOR warships are strategically deployed to deter piracy attacks and quickly rush in to support and rescue merchant ships attacked by pirates. Due to perceived legal uncertainties and as it is often difficult to accurately prove acts of piracy, many countries are not eager to prosecute pirates at their own courts. Consequently, in various incidents suspected pirates detained by international naval forces were released as no country was willing to prosecute them back home. Thus, the EU entered into negotiations with Kenya and other Somalia neighbouring countries to sign agreements that allow for the prosecution of pirates detained by naval forces under EU NAVFOR command in the respective east African states. Such agreements currently exist with Kenya (signed in March 2009), and the Seychelles (signed in November, (see below). However, the USA want more such agreements to be made with neighbouring states. At the time of writing, there are more than one hundred suspected Somali pirates in Kenyan prisons. Additionally, a handful of suspected pirates is due to be tried in the USA, Spain France and other countries. Several multinational initiatives were launched to better plan, coordinate and implement anti-piracy policies and strategies. A multilateral Contact Group on Piracy off the Coast of Somalia (CGPCS) was created in January 2009 and in the same months, under the leadership of the International Maritime Organization (IMO), a conference on Piracy in the Gulf of Aden and the Indian Ocean was convened in Djibouti. Several follow-up meetings have taken place since then. Moreover, not only politicians responded to the steady acts of piracy but also the shipping industry. Based on the “Best Management Practices to Deter Piracy off the coast of Somalia” ship owners and their crews have taken precautions against piracy attacks, including higher alertness and a 24-hours look-out, pieces of wood at ship entries, charged fire hydrants and zig-zagging courses. It is also recommended to fence ships with barbed wire in order to make boarding more difficult, but only very few vessels have actually taken up this advice. Additionally, some merchant and fishing vessels now sail with armed security guards, often marine soldiers deployed under one of the international naval missions. These international military efforts and strategies, while not eradicating piracy, were to a certain degree effective in containing the number of successful attacks. The US State Department announced that while the number of attempted attacks has increased steadily over the last years, the rate of actually successful boardings has dropped from 60 percent in 2007 to 25 percent in 2009. The attempted hijacking of the Antigua and Barbuda-flagged Ariella, as reported by the BBC on February 5, is a case in point. When the ship was boarded by Somali pirates, its crew send out distress signals and, after consultation with a nearby Danish navy unite, locked itself up in a safe room. The pirates escaped before the arrival of the Danish Helicopter and its Special Forces, but later on one of their skiffs and its crew were detained by a Russian warship. In sum, despite the preliminary “success” of the militarization and securitization strategy, this way of responding to the piracy problem seems not to offer a convincingly real prospect to finally and sustainably stop piracy activities off the Somali coast. As already indicated above, more recent tendencies seem not to indicate that military efforts alone will do the job. Since the beginning of 2009, when the increased presence of naval forces seemingly made piracy in the Gulf of Aden more dangerous and difficult, the pirates have expanded their area of operation into the Indian Ocean. Using so-called ‘mother ships’, small vessels and trawlers that are also hijacked, they have staged several attacks close to the Seychelles, in some cases more than 1000 nautical miles (1850 Km) off the coast of Somalia. The international community responded to this evolving trend by expanding its naval missions, again pursuing a military strategy of deterring and combating. In November 2009, the European Union and the Seychelles have signed an agreement allowing EU naval forces to hunt and detain pirates in the territorial waters of the Indian Ocean Island. Similar agreements already were signed with France and the USA. An exchange of letters in February 2010 means that suspected pirates caught by the European Union’s naval mission in the region can be tried in the Seychelles. Yet, even if the naval missions were able to deter piracy, it would probably only be a temporary halt and the attacks are likely to resume as soon as the international naval forces have left. However, it seems to be doubtful if only 40 warships can effectively police and protect an area of approximately five million square kilometres. Incidents of armed robbery have continued despite the military build-up in the Indian Ocean. On 30 December 2009, BBC reported that Somali pirates seized two vessels in the Gulf of Aden and in the Indian Ocean. A Saudi Tanker was hijacked outside the IRTC on 3 March 2010, after pirate incidents had dropped in the months before due to bad weather. Two days later, EU NAVFOR was able to arrested eleven suspected pirates, but on 6 March pirates struck again, this time off the coast of Madagascar. Moreover and quite contrary to the respective policy goals, recent developments suggest that the militarization of the Gulf of Aden and the Indian Ocean – although it seemingly has reduced the number of successful attacks – resulted in an increase of the average ransom and a more violent rhetoric by the pirates. According to Reuters, in January 2010, a ransom believed to be between $5.5 million and $7 million was paid for an oil tanker which was hijacked near the Seychelles. Generally, it has been assumed that the average ransom has increased from roughly $1 million in 2008 to $2 million in 2009. This reflects the rising costs and risks for piracy ventures – as well as the willingness of shipping companies to pay for the release of their vessels and its crews. Thus, it is estimated that millions of Dollars have been paid to Somali pirates in 2009. That is, quite obviously piracy continues to be a profitable business in Somalia, despite the impressive military build-up of the international community. Furthermore, the case of the Alakrana, a Spanish tuna trawler that was hijacked on 2 October 2009, can also be used to illustrate the multiple effects and dynamics of this militarization. A day after the hijacking, Spanish naval forces arrested two pirates it suspected to be part of the gang that had kidnapped the Alakrana. The two were deported to Spain, where a new anti-piracy law was drafted to enable prosecution. Yet, in response to the Spanish boost of more coercive engagement, the pirates reportedly increased their demand for ransom to $4 million, far more than the $1.2 that were paid for another Spanish trawler in April. Additionally, they demanded the release of their two colleagues and threatened to kill hostages. Such prisoner exchanges, whereby hostages are exchanged against jailed pirates, are not new in the Somali piracy context and have previously taken place in September between a group of pirates in Puntland and the Seychelles government, as several news agencies reported. The standoff around the Alakrana, however, subsequently was resolved with the payment of a $3.5 million ransom to the pirates, while their two colleagues remained imprisoned. It remains to be stated, that as the pitfalls and shortcomings of the current anti-piracy measures off the coast of Somalia become more and more apparent, commentators have pointed out time and again that piracy has to be fought on land and not at sea, and that a successful strategy has to strengthen cooperation with local actors in Somalia itself and enhance their capacities to combat the pirates within their territory. Accordingly, since August 2008, NATO held several meetings with officials from Puntland in order to “enhance the knowledge of the international counter-piracy community, while providing assistance to the Coastguard”.This approach could certainly be expanded and more direct support could be channelled to regional and local actors. Nevertheless, it is still unclear if this only implicates a further militarization of the international anti-piracy strategy and its spatial expansion into Somalia. However, pursuing such an extended but still in principal military strategy, is also not likely to be unproblematic and produce sustainable success. While the Puntland administration can certainly provide important information for international naval missions, it is disputable that it has the capacities to fight piracy in its territory. As a matter of fact, although Puntland security forces have arrested several pirates, its coast remains the epicentre of Somali piracy. Moreover, without doubt expanding the military strategy into Somalia could spark conflict and further destabilize the region. The securitization and militarization strategy of the international community has seemingly contained piracy and decreased the number of successful attacks. Given that the current strategy is resumed and cooperation between the naval forces, shipping companies and crews, neighbouring states as well as regional Somali states is further enhanced, this trend is likely to continue in 2010 and, as the risks and costs for pirates increase, might even reduce the number of attempted attacks. Yet, it is very unlikely that piracy can be eradicated in that way and certainly this does not diminish any of the root causes. Instead, as piracy attacks have continued in recent days, it is quite apparent that further pursuing a militarization strategy is neither an effective, nor a sustainable solution for the “piracy problem” off the Somali coast. Moreover, it seem that militarisaion produces some unintended and undesired consequences. As the costs and risks of piracy ventures rise, the pirates expande their operations far into the Indian Ocean, increase demands for ransom, become more professional and (perhaps) more radical in achieving their objectives (and thus resembling the international community and its military efforts). Accordingly, as the international community clings to its military strategy,, the stage seems to be prepared for the next round of the naval battle off the coast of Somalia, with no solution insight. ICC International Maritime Bureau 2010: Piracy and armed robbery against ships. Annual Report. 1 January – 31 December 2009. See MSCHOA Website at http://www.mschoa.eu/ and MSCHOA/INTERTANKO 2009: Best Management Practices to Deter Piracy off the coast of Somalia. EU – Kenya Agreement on Transfer of Pirates, Embassy of the Czech Republic in Nairobi, 06.03.2009. U.S. wants more African states to prosecute pirates, Reuters, 03.03.2009. The Contact Group on Piracy off the Coast of Somalia, US State Department, 18.05.2009. High-level meeting in Djibouti adopts a Code of Conduct to repress acts of piracy and armed robbery against ships, IMO, 30.01.2009. UN: Anti-piracy Measures Help In Bringing Down Successful Pirate Attacks, RTTNews, 29.01.2010. See also MSCHOA/INTERTANKO 2009: Best Management Practices to Deter Piracy off the coast of Somalia. Officials say 47 countries trying to block attacks, pirates far less successful off Somalia, Associate Press (on Latima.com), 18.02.2010. Nato troops free ship off Somalia, BBC, 05.02.2010. EU and Seychelles sign anti-piracy agreement, Reuters, 10.11.2009. Seychelles agrees to try suspected Somali pirates, AFP, 06.02.2010. Pirates hijack Norwegian tanker, BBC 06.03.2010. Pirate capture complicates hostage issue, Times, 11.11.2009. Puntland ‘seizes Kenya-bound planes that transported pirate suspects’, Garowe Online, 06.09.2009. Somali pirates free Spanish boat, BBC, 17.11.2009. NATO Meeting with Puntland Coast Guard, NATO, 19.01.2010. See also “Operation Ocean Shield Current News” at: http://www.manw.nato.int/page_operation_ocean_shield.aspx . Somalia: Puntland forces nab wanted pirate in Bossasso, Garowe Online, 30.11.2009. Awesome! Good to know that there is an international response. An interesting discussion is worth comment. I do think that you need to publish more about this topic, it might not be a taboo subject but usually people don’t speak about such issues. To the next! Best wishes! !